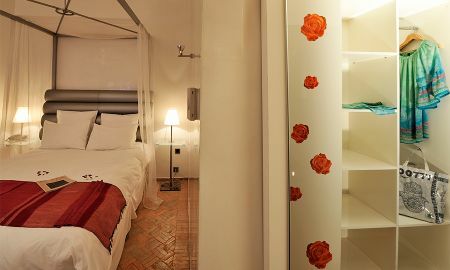 Murano Resorts is an exceptional urban Resort with a Parisian influence, which orients its concept and imagines its alterego on the Moroccan deserts doors. In the serenity of the legendary Palmeraie, Murano Resort Marrakech is a place preserved from the bustle outside, an oasis of peace and tranquility. In a 3-hectare park hundred palm trees, olive trees and mandarin, the Murano Resort which marries contemporary design with Marrakech's distinctive architecture. If outside the villas scattered throughout the property remains in the Moroccan tradition with oval windows and walls in red mud, the interior married design and comfort. The villa «Murano» contains a lounge, restaurant, bar and meeting rooms with a terrace of 200 square meters offering an overview of the park. The red pool, with its uniqueness and its music is a privileged place in Marrakech. More deprivation and secret pools of the villas offer discretion and relaxation for romantic couples. The 30 junior suites and suites are spread across 4 villas. 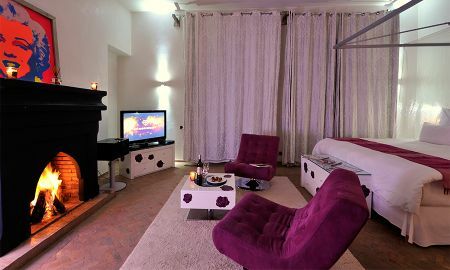 Each room and suite has its fireplace and terrace with a magic view on the park, the Atlas and the desert. 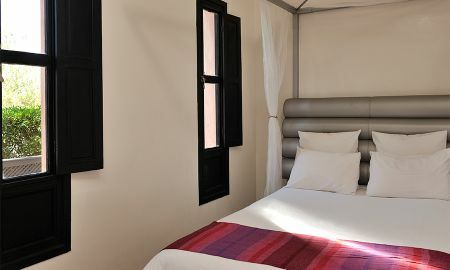 At the foot of the majestic chain of the Atlas, Marrakech, offers a mild and sunny throughout the year. Ideally located in North-East of the Red City, the heart of the Palmeraie Marrakesh, Murano Resort is only 20 minutes from the airport and 15 minutes from the Medina.